As you can see, I've also just begun the cuff of its mate. Not sure if the second will progress as quickly as the first, but it might. In weaving news, I have good news and bad news to report. The good news is that the dining and living room floors should hopefully be done this month, which will mean being able to get furniture, boxes, etc., out of the spare room and my studio. That means the loom will be accessible again. The bad news is that my studio has no heat. I can open up the French doors during the day to let heat in, or I can spend time in there comfortably if the sun is shining and warms the room up. However, I shut the doors again at sundown because of all the windows in the room. There's quite a bit of heat loss so it keeps the house warmer to simply shut that room off for the night. January and February are our coldest months of the year, but perhaps we'll have plenty of sunny days to enjoy. I hope your new year is off to a good start. Ours promises to be a very busy but productive one. And yay on the floors being done! That's a bummer that your studio is cold in your coldest, and presumably least active outdoor, months. I know the uncomfortable temperature in my studio (in summer in my case) makes my production plummet. Or maybe it's all the playing outside? Our house does not have energy saving windows either. I made drapes with heavy upholstery fabric. It has helped a lot both with the bill and being able to keep temps regulated. Pretty sock! The sock looks nice and warm! I guess you'll need it when you start weaving... I hope you'll get a lot of sunny weather! Is there any way to eventually get heat into your studio? 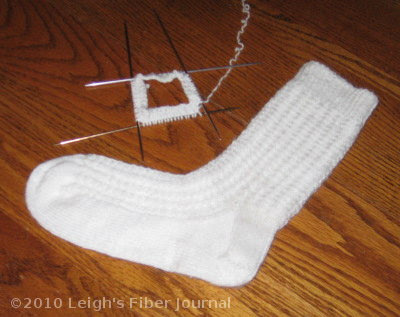 What a neatly knitted and comfy looking sock! I would not fancy an unheated studio, unless vigorously weaving a large rug and beating it hard. Could you install any kind of heat source? Your sock looks so nice and warm! My craft studio would be very cold if it wasn't for the little pellet stove that we put up there. It only take about 30 minutes and its 70 and I have to turn it off! Maybe you need a little space heater. One down one to go. Sure is pretty!! I think the others said it very well. You HAVE to get a heat source in there. I mean, once you get the house done, you are going to want to weave in the winter. Now make another one, just like the other one!